This delicious vegetarian pizza has a thin and crispy base, with a joyously juicy homemade, garlicky tomato sauce beneath comforting melted mozzarella and cheddar cheese. 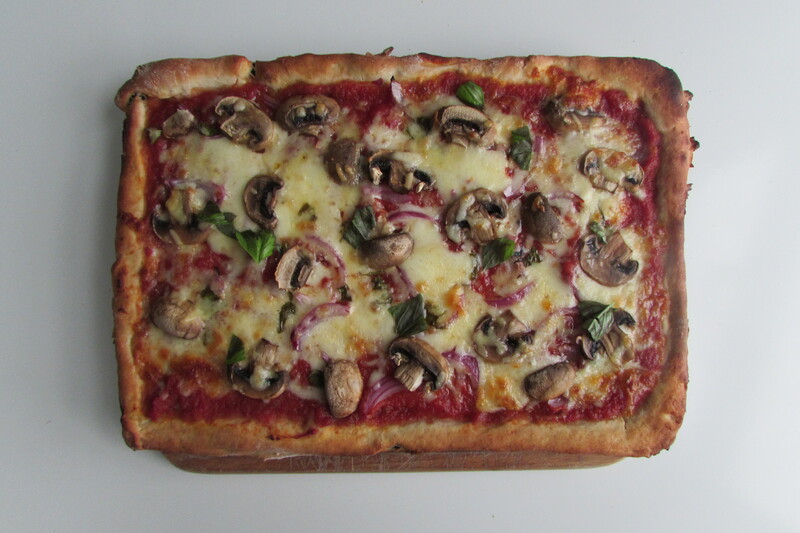 It’s topped off with mouthwatering mushrooms, sweet red onions and fresh basil leaves. It’s simple and satisfying and is cheap to make. Make a couple of these and impress your friends at a dinner party, or cut it up and serve it as finger food as part of a birthday buffet. This recipe can easily be adapted if you fancy adding different toppings. I always forget how easy it is to make pizza from scratch. And with this recipe, you needn’t buy any obscure flour; you can get a nice thin crust with the plain stuff. The only issue is the washing up afterwards! I was on holiday in Sardinia, Italy, a few weeks ago and it struck me how many of the pizzas there had only one or two toppings. In the UK, and with takeaway pizzas especially, a vegetarian pizza usually consists of mushrooms, sweetcorn, peppers, onion et al, which I very much enjoy, but sometimes it’s nice to just pick out a couple of your favourite veggies and appreciate them on their own. Make the tomato sauce: put a medium to large frying pan on a medium heat and pour in the olive oil. Add the onion and fry for five minutes, or until softened, stirring frequently. Add the crushed garlic and mix in with the onion. Fry for a further two minutes. Pour in the chopped tomatoes, squeeze in the tomato puree, and add the sugar and seasoning. Bring to the boil, stirring occasionally. When the tomatoes are bubbling, reduce the heat. Mix in the chopped basil leaves and leave to simmer while you prepare the dough. Put the oven on to gas mark 8 to heat up. Make the dough: tip the flour into a large bowl along with the yeast, sugar and salt. Mix together. Pour in the water and mix together well with a wooden spoon until the mixture comes together to form a sticky dough. Sprinkle a generous helping of flour onto your work surface, pick the dough up out of the bowl and begin to knead it for five minutes, or until it is smooth. Using a brush, grease a baking tray sized approximately 25cm longways with olive oil. Sprinkle some more flour onto the work surface and use a rolling pin (or wine bottle if you don’t have a pin) to roll out the dough so it’s nice and thin, and will cover the baking tray. Give the tomato sauce a stir and take it off the heat. Carefully pick the pizza dough up off the work surface and onto the baking tray. Trim the edges with a knife if it’s a bit too big for the tray, so it’s nice and neat. Put the tomato sauce into a measuring jug, or container with high sides. Use a hand blender to blitz the sauce and make it lovely and smooth. Pour the tomato sauce over the dough and use a knife to spread it out evenly. Sprinkle over three quarters of the mozzarella cheese and cheddar, then the onion and mushrooms. Then sprinkle over the rest of the cheese, followed by some chopped basil leaves. Place in the oven on the middle shelf, for 15-20 minutes, or until the base and the cheese have turned golden. Serve with a mixed green salad and wash it down with a full bodied bottle of wine.